Fishing Trip to Lake Alexandrina – Rainbow or “Rambo” Trout! Sam was just 7 years old when he wrote this piece. It is a great story! 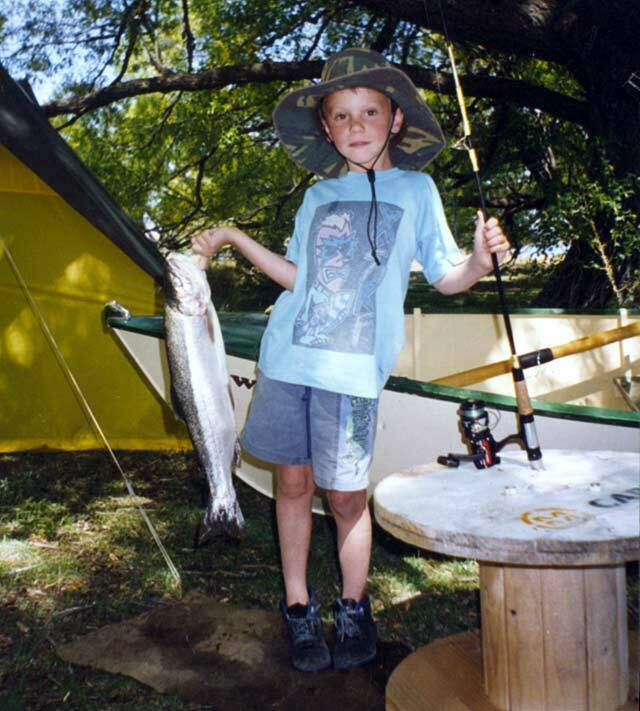 Samuel Wood, when aged just seven, with his first trout, a three and a quarter pound rainbow from Lake Alexandrina. On Saturday we went to Lake Alexandrina. When we arrived, Dad got the car stuck in ” loose shingle, but a man that Dad knew had a big brown truck with a hook and he pulled the car out, leaving the boat in the water. We then put the camping and ﬁshing gear into the boat. When we got to camp we took the camping gear out of the boat. Dad said, “get the tent up, and you get a snack.” So we put the tent up and got our snack. I thought Dad was tricking us, but he wasn’t. We set up to the campsite. Ben and I found some old cable drums to use as tables, which we rolled along the track to our tent. Dad thanked Ben and me for a good idea. We had a snack on the tables. We had ‘Just Juice’ and chips. It was yum! I said, “thank you, Dad. It was time now to go ﬁshing before tea. We saw some ﬁsh jump out of the water to catch ﬂies. We were using wobblers though. Ben used a black and gold Toby, and I liked the look of a silver Glimmy. Dad said that it would look to the trout like a smelt. Dad was using a wet fly that he made called a green bug. Kilwell Sports 7g Glimmy. We met Mr Pope who was fishing near us in his boat. He was a friend of Mr Shipman, our neighbour. He likes fishing at Lake Alexandrina too. Mr Pope caught two baby ﬁsh. Well, l thought they were baby ﬁsh. I wanted to catch a big one. “Do I have to do this?” But I did. When it got dark we couldn’t see, but Dad had a torch to show the way home. He got me to hold the torch. We saw the camp from the boat and Dad rowed. Mr Pope came too, but I was on the toilet again and got off straight way, and pulled my trousers up before he saw me! l forgot who he was. He told Ben and me how to light a ﬁre. It went so high we had to stop putting wood on it so we could cook. We had a gas lantern too. We had baked beans for tea and they tasted good. As we ate, a hedgehog came to join us. We called it “Mr Podgey” because his prickles had turned into a fat little ball. Ben sat beside Mr Podgey and he sniffed Ben’s foot. Ben laughed and so did I. I couldn’t stop laughing. Dad showed us how to cook on a ﬁre. The pot got burned. Dad got some water to heat so we could clean the dishes. Dad said, “Ben, the gas barbeque please!” Dad told me to get the gas and we heated the water and cleaned the dishes. Then we went to bed and Dad read us a long nursery rhyme before we played a story game. You see, someone starts the game and someone else has a go. It was fun. Then we went to sleep. In the morning we had to wait for Dad because he was out ﬁshing. He told us to light the ﬁre or catch lizards until he was ﬁnished. I lit the ﬁre as Mr Pope had shown me and Ben caught a skink. It was fun. When Dad returned and said, “Where is breakfast?” I said, “You didn’t say we had to cook breakfast.” So Dad cooked some eggs and sausages, it was the best! Then we got ready for a morning ﬁshing on the lake, as it was so calm. When we were away from the shore, Ben cast for me, then cast for himself. Ben was using his Toby, and l chose to keep ﬁshing with the little Glimmy. At ﬁrst we anchored off the island and Mr Pope returned to join us. It was so peaceful and quiet except for Mr Pope and Dad talking. We got tired of casting and not catching anything, so Dad pulled the anchor up and rowed around the island toward Rocky Point, while Ben and I trawled the wobblers behind the boat. Mr Pope was lucky. 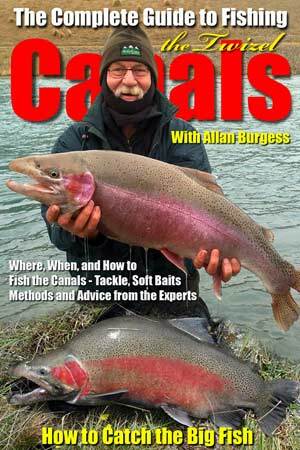 He had already caught two. Then suddenly, Ben saw a nice rainbow trout jump clean out of the water. We call them “Rambo” trout because of how hard they ﬁght. Then I hooked it! It was really hard to pull in, and I asked if Dad would pull it in for me. He said no because then l wouldn’t be able to say that l caught it. So I just kept hanging on, winding a little at a time while my “Rambo” skipped along the surface and then dived down, time and time again. It was fun! Finally, the fish got so tired that Dad was able to net it for me. I needed a drink and asked Dad to pass my Just Juice. Dad said l should have a drink because l deserved it. l said, “thanks” and drank it up. We all had a drink to celebrate my first trout, a lovely three and a quarter pound rainbow. When we had finished, Ben cast my rod again, and Dad rowed around the island toward Rocky Point. Ben kept seeing fish jumping. He is called ”Hawkeye” when we go up the country as he is good at spotting things like fish and rabbits. Ben and I went ashore to chase rabbits and lizards. Before we went back to camp Dad rowed around this big bay and we saw heaps of ducks, swans and some crested grebes, and shags. Dad hates the shags as he says they carry worms that get into the trout and spoil the flesh. When we got to camp we made a cup of tea over the ﬁre and then it was time to go home. When all the gear was packed in the boat, l hopped in and Dad cast for me. Ben walked on the track while we trawled and it took about thirty-five minutes to get back to where the huts and our car were, at the outlet of a creek. At first, I only got bites, then I hooked a good one but it got away. l can’t wait for summer to come again so we can go back to Lake Alexandrina for another overnight fishing trip. If you are up there sometime and stop for a break opposite the island, under the slip on the hill, you just might see our campsite and use our cable drum tables! l would like to tell you why it took us three hours to get home, but that is another story!